The venue is close to [P06] Shimin Hiroba (Convention center) Station of the Port Liner monorail (Kobe New Transit). It takes 8 minutes to [P06] Shimin Hiroba from [P09] Kobe Airport (adult: JPY 250) and 10 minutes from [P01] Sannomiya, the main hub of Kobe (adult: JPY 250). From 3/15 (Friday) ~ 3/17 (Sunday), portliner and surrounding stores (convenience stores and restaurants) will be very crowded due to a large event held at Kobe World (memorial) Hall. The advance preparation, such as purchase of ticket, charge of IC card, purchase of lunch, etc. are strongly recommended. In Sannomiya, the ticket gate of portliner is away from that of JR, Kobe city subway, Hankyu Railway or Hanshin Electric Railway. If you are going to use portliner for the first time, we recommend you to check the interior map of Sannomiya station once. Kobe International Conference Center / Kobe International Exhibition Hall, Hall No. 2 bldg. 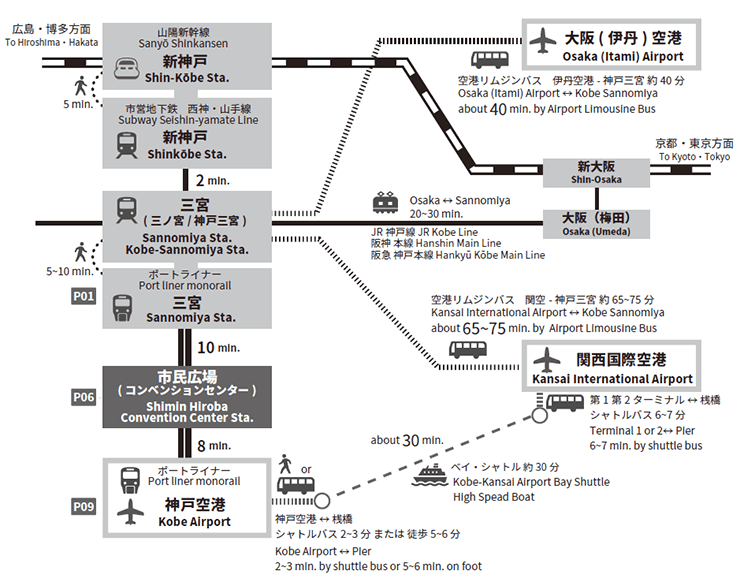 Usage information of Port liner monorail, Airport Limousine Bus, and Kobe-Kansai Airport Bay Shuttle are available in the websites.